Summary: Turning a web app into a Progressive Web App (PWA) and submitting it to 3 app stores requires about a month of work, a few hundred dollars, and lots of red tape. 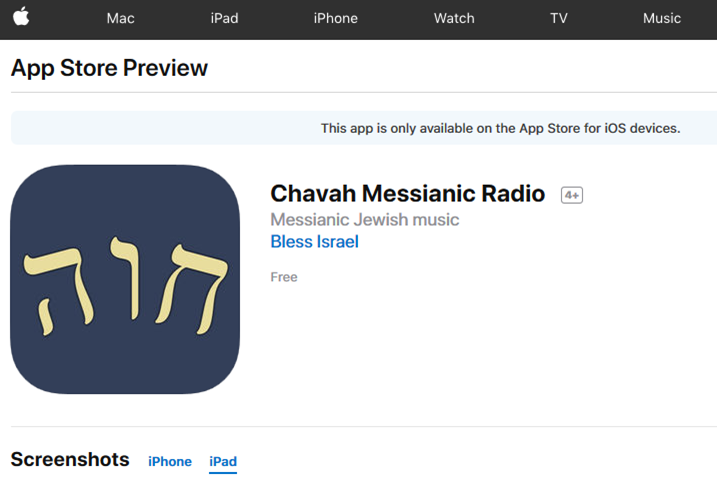 I recently published Chavah Messianic Radio, a Pandora-like music player, as a Progressive Web App and submitted it to the 3 app stores (Google Play, iOS App Store, Windows Store). The process was both painful and enlightening. Here’s what I learned. The answer, in a nutshell, is because that’s where the users are. We’ve trained a generation of users to find apps in proprietary app stores, not on the free and open web. They ask that because we’ve trained users to look for apps in proprietary app stores. But I was kind of lying. Real web apps only kinda-sorta work on mobile. Which brings me to the 2nd reason: web app restrictions by Apple hostile mobile platforms. Mobile platform vendors, like Apple, are totally cool with apps that use your phone to its fullest. Access your location, play background audio, get your GPS coordinates, read all your contacts, play videos or audio without app interaction, read your email, intercept your typing, play more than one thing at a time, use your microphone and camera, access your pictures, and more. Apple’s totally cool with that. But only if you pay Apple $99/year for the privilege. If you want to do any of those things in a regular old web app, well, goshdarnit, Apple won’t just deny you these things, it prevents you from even asking permission. For my Pandora-like music player app, this horrible brokenness showed up in numerous ways. Oh, plus weird visual anomalies like typing in a textbox and seeing your text appear elsewhere on screen. So, to make my HTML5 music app actually functional and working on people’s mobile devices, it was necessary to turn my PWA into an app in app store. You’ve published a Progressive Web App. Publish to app stores? But alas, we don’t live in this ideal world. Instead, we have to deal with all kinds of proprietary native BS to get our web apps in the stores. Each of the app stores has a barrier to entry: how difficult it is to take an existing web app and it in the app store. I list some of the barriers below. Apple: $99/year to have your app listed in the iOS app store. Google: One-time $25 fee to list your app in the Google Play Store. Don’t make me pay you to make my app available to your users. My app enriches your platform. Without good apps, your platform will be abandoned. Apple used to understand this. When it first introduced the iPhone, Steve Jobs was adamant that HTML5 was the future and that apps will simply just be web apps. There was no native iPhone SDK for 3rd parties. Apple has since abandoned this vision. Google asked for a token $25 one-time fee. Probably to avoid spammers and decrease truly junk apps from entering the store. Microsoft seems determined to just increase the total number of apps in their app store, regardless of quality. Winner: Microsoft. It’s hard to beat free. For me, that means my web app plays background audio using standard HTML5 audio; that works just fine on all OSes. My web app declares what audio is playing, and the OSes pick up on that, show currently playing song info on the lock screen. My app controls audio using standard HTML5 audio API; the OS picks up on that and provides play/pause/next/volume/trackbar controls on the lock screen. But sadly, we don’t live in this ideal world. All the things listed above don’t actually work out of the box on all 3 platforms. My web app needs to play audio in the background. And load URLs from my CDN. Sounds reasonable, right? And bonus, how about showing currently playing song info on the lock screen? And controlling the audio (play/pause/next, etc.) from the lock screen? How hard is this? Apple: We don’t give web apps a way to declare such capabilities; you’ll need to write a native wrapper (e.g. with Cordova) to interact with the OS. Google: Web FTW! Let’s create a new web standard that shows audio & controls from the lock screen. Background audio? Sure, go ahead! For iOS app store, does your web app need to play background audio? Use a Cordova plugin. Need to show currently playing song on the lock screen? Use a Cordova plugin. Need to control the currently playing song from the lock screen? Use a Cordova plugin. You get the idea. Basically, Cordova tricks Apple into thinking you’re a native app. And since you’re not a yucky web app, Apple lets you do all the things native apps can do. You just need native tricks – Cordova plugins – to let you do it. For Google Play, it’s nice that I can just write JS code to make this work; no Cordova plugins required here. Of course, that JS won’t work anywhere except Chrome on Android…but hey, maybe one day (in an ideal world!) all the mobile browsers will implement these web APIs…and the world will live as one. I’m almost ready to bust out some John Lennon hippie utopia tunes. For Windows Store, do you want to play background audio? Sorry! That is, unless you declare your intentions in our proprietary capabilities manifest file (easy) AND you implement this proprietary media interface using window.Windows.SystemMediaTransportControls (not so easy). Otherwise we’ll mute you when your app goes to the background. Loser: Apple. They don’t care about web apps. Actually, it’s worse than that. It feels like they are actually hostile to web apps. iOS Safari is the new Internet Explorer 6. It has lagged behind in nearly every web standard, especially around Progressive Web Apps. This is probably for business reasons: web apps disrupt their $99/year + 33% in-app purchases racket. So to make my web app work on their platform, I have to basically pretend I’m a native app. Apple: You must prove that you’re a legal, registered business. This verification isn’t done by us – but by a 3rd party, which may or may not know about your business. Google: You want your app in our store? Cool by us. Microsoft: You want your app in our store? Cool by us. The biggest pain point for me was getting verified as a legal business by Apple. A bit of Googling showed that “D&B profile” is Dun and Bradstreet. I’ve never heard of this group before, but I find out that Apple is using them to verify you legal corporation details. 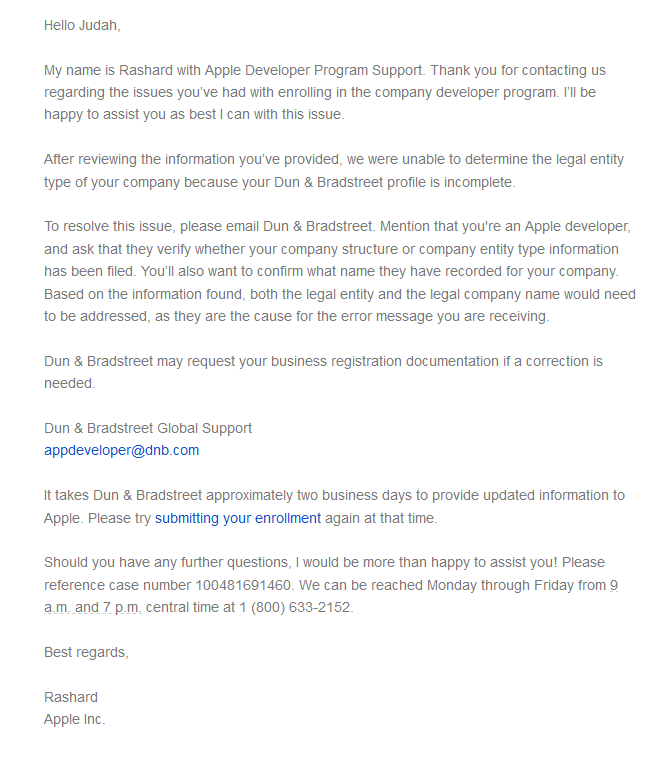 And apparently, my D&B profile didn’t match what I put in my Apple Dev registration. I google some more and find the Apple dev forums littered with similar posts. Nobody had a good answer. I contact Apple Dev support. 24 hours later, I’m contacted by email saying that I should contact D&B. I decide to contact them…but Apple says it will take up to a few days for them to respond. At this point, I’m thinking of abandoning the whole idea. While waiting for D&B support to get back to me, I decide to go to the D&B site, verify my identity, and update my company information which, I assume, they had taken from government registration records. Did I mention how sucky this is? I just want to list my existing web app in the store. Plz help. You know, because digital information can take 2 days to travel from server A to server B. Sigh. Two days later, I try to register…finally it works! 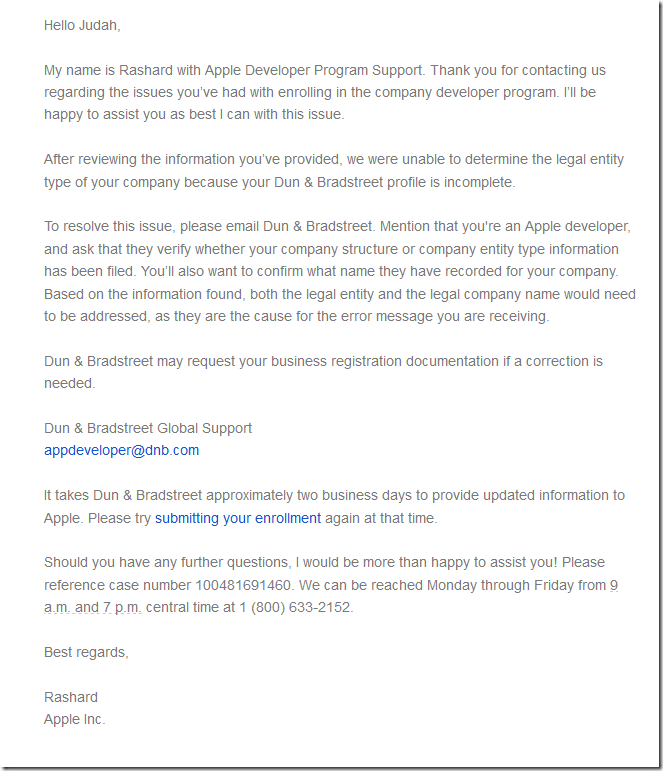 Now I’m in the Apple Developer program and can submit apps for review. Winner: Google and Microsoft; both took all of 5 minutes to register. If there is any saving grace here for Apple, it’s that they have a 501c3 non-profit program, where non-profits can have their $99 annual fee waived. I took advantage of that. And perhaps this extra step complicated matters. Once you have a web app, you have to run some magic on it to turn it into something you can submit for App Store review. Google: Download Android Studio, generate a security certificate through it, then package it using the Studio. Upload the package to Android Developer website. Microsoft: Generate an .appx package using these free command line tools, or Visual Studio. Upload to the Microsoft Dev Center website. For Windows, it actually generates the .appx package. You can literally take that and submit it on the Windows Dev Center site. For Google, it generates a wrapper Java app that contains your PWA web app. From Android Studio, you build this project, which generates the Android package that can be uploaded to the Android Dev Center site. For Apple, it generates an XCode project which can be built with XCode. Which requires a Mac. Once again, Apple was the most painful of all of these. I don’t have a Mac. But you cannot build the XCode project for your PWA without a Mac. I don’t want to pay several thousand dollars to publish my free app in Apple’s app store. I don’t want to pay for the privilege of enriching Apple’s iOS platform. Thankfully, MacInCloud costs about $25/month, and they give you a Mac machine with XCode already installed. You can remote into it using Windows Remote Desktop, or even via a web interface. It wasn’t enough to just build the XCode project and submit. I had to generate a security certificate on the Apple Developer site, then create a new app profile in a separate site, iTunes Connect, where you actually submit the package. And that wasn’t all: since Apple is hostile to web apps, I had to install some special frameworks and add Cordova plugins that allow my app to do things like to play audio in the background, add the current song to the lock screen, control the song volume and play status from the lock screen, and more. This took at least a week of finagling to get my app into a working state before I could submit it to the app store. Winner: Microsoft. Imagine this: you can go to a website that generates an app package for your web app. And if that’s not your thing, you can download command line tools that will do the job. GUI person? The free Visual Studio will work. Runner-up: Google. Requires Android Studio, but it’s free, runs everyone, and was simple enough. Loser: Apple. I shouldn’t have to buy a proprietary computer – a several thousand dollar Mac – in order to build my app. The Apple Dev Center –> iTunes Connect tangling seems like an out-of-touch manager’s attempt to push iTunes onto developers. It should simply be part of Apple Developer Center site. Once you finally did all the magic incantations to turn your existing web app into a mobile app package, you probably want to send it out to testers before releasing your app on the unwashed masses. Apple: For testing, you have your testers install Test Flight on their iOS device. Then you add the tester’s email in iTunes Connect. The tester will get a notification and can test your app before it’s available in the app store. Google: In Android Dev Center, you add email addresses of testers. Once added, they can see your alpha/beta version in the App Store. Microsoft: I didn’t actually use this, so I won’t comment on it. Winner: Toss up. Apple’s Test Flight app is simple and streamlined. You can control alpha/beta expiration simply on the admin side. Google wasn’t far behind; it was quite painless, not even requiring a separate app. Apple: Prior to submission, XCode warns you about potential problems during build. The human app review takes about 24-48 hours. Google: Anybody home? Android Studio didn’t tell me about any potential problems, and my app was approved within minutes of submission. I don’t think a real human being looked at my app. Microsoft: Upon submission, a fast programmatic review caught an issue pertaining to wrong icon formats. After passing, a human reviewed my app within 4 days. Sure, as a developer, I like the fact that my app was instantly in the Google Play store. But that’s only because, I suspect, it wasn’t actually reviewed by a human. Apple had the quickest turnaround time for actual human review. Updates also passed review within 24 hours. Microsoft was hit or miss here. The initial review took 3 or 4 days. An later update took 24 hours. Then another update, where I added XBox platform, took another 3-4 days. It’s painful, and costs money, to take an existing PWA and get them functional on mobile platforms and listed in the App Store. Loser: Apple. Don’t require me to buy a Mac to build an iOS app. Don’t force me to use native wrappers to integrate with your platform. Don’t require me to screw around with security certificates; let your build tools make them for me, and store them automatically in my Dev Center account. Don’t make me use 2 different sites: Apple Dev Center and iTunes Connect. Final thoughts: The web always wins. It defeated Flash. It killed Silverlight. It destroyed native apps on desktop. The browser is the rich client platform. The OS is merely a browser-launcher and hardware-communicator. The web will win, too, on mobile. Developers don’t want to build 3 separate apps for the major platforms. Companies don’t want to pay for development of 3 apps. The answer to all this is the web. We can build rich web apps – Progressive Web Apps – and package them for all the app stores. Apple in particular has a perverse incentive to stop the progress of the web. It’s the same incentive that Microsoft had in the late ‘90s and early 2000s: it wants to be the platform for good apps. PWAs undermine that; they run everywhere. My suggestion to mobile app platforms is embrace the inevitable and either automatically add quality PWAs to your app store, or allow developers to easily (e.g. free, and with 3 clicks or less) submit a PWA to your store. Readers, I hope this has been helpful glance at PWAs in App Stores in 2018. Have you submitted a PWA to an app store? I’d love to hear your experience in the comments. Mike on I built a PWA and published it in 3 app stores. Here’s what I learned. Phil Allison on I built a PWA and published it in 3 app stores. Here’s what I learned. Judah Gabriel Himango on I built a PWA and published it in 3 app stores. Here’s what I learned.